Chooks, it seems, are inspiring. 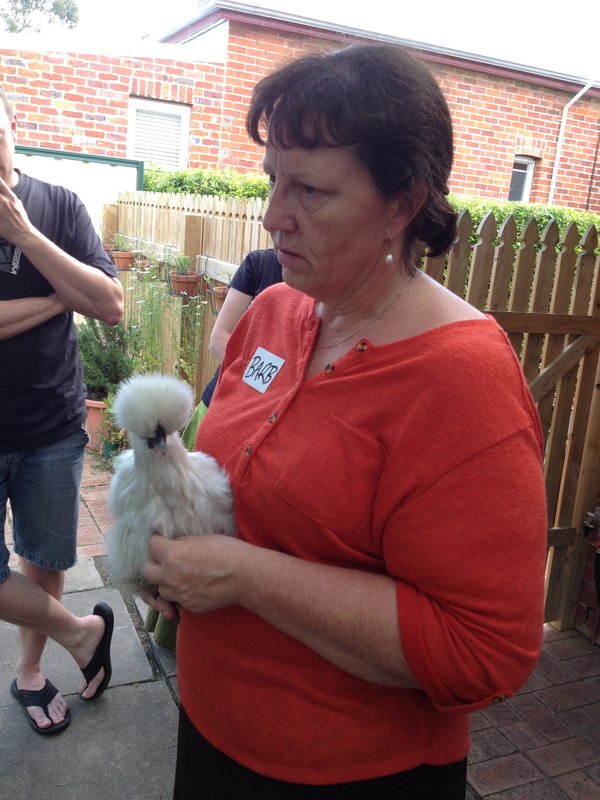 After the great success of TTG’s waste reduction initiation, the Sunnyside Up project, and by popular demand, the Kitchen Gardeners’ Society was delighted to present Chooks in the backyard. Generously hosted by Flo, Tristan and Tim, along with Sian, Tim and Olive, lots more Kitchen Gardeners are now busily constructing poultry palaces and deciding whether to buy free range pullets or rescue battery hens. Veterinarian Barb (seen here cuddling one of Flo, Tristan and Tim’s chooks) took us through basic chook care. 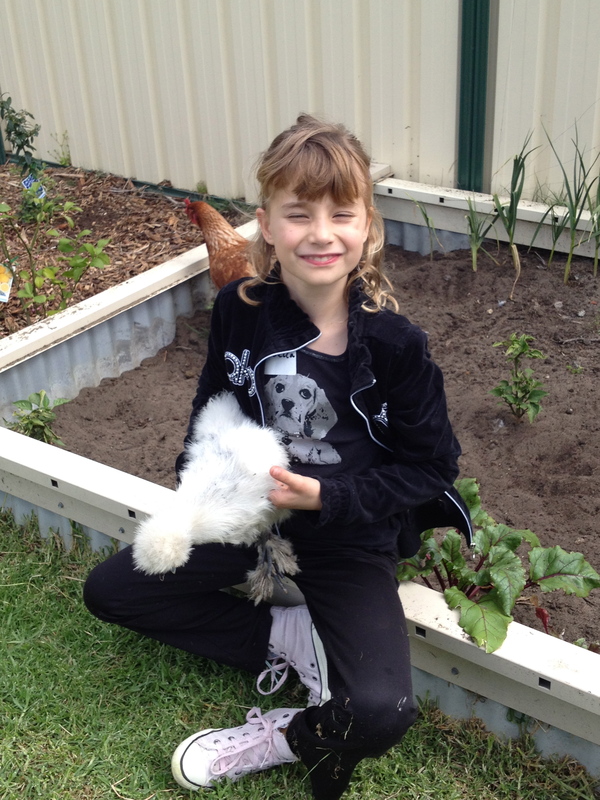 She covered good nutrition, chook psychology, basic physiology, some common sickness and afflictions of chooks and their basic veterinary care. We had lots of discussion, talking through experience and concerns, and sharing chook stories. It is important to know what your local council regulations and expectations are and how to comply. Here’s Rebecca who just loves chooks. 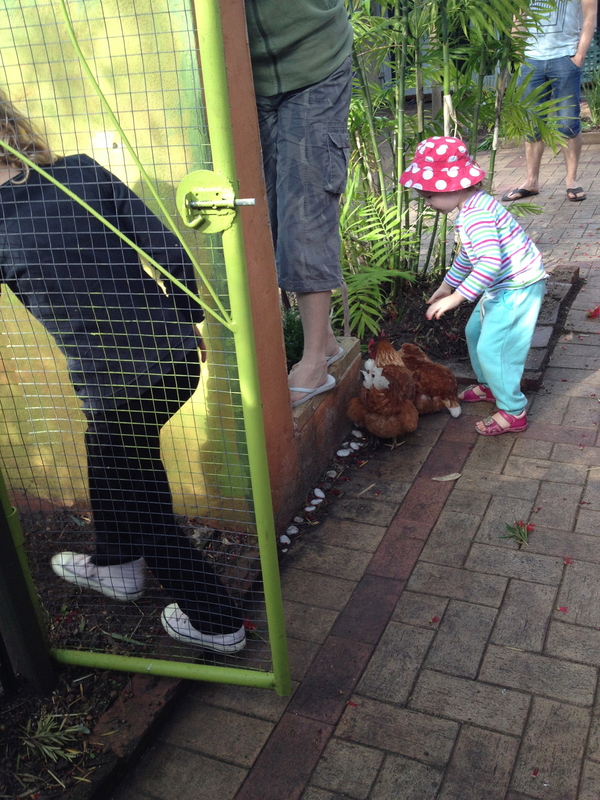 Her super power is that she can catch any chook, no matter how determined said chook is not to be caught. It’s also important to manage your neighbours. We talked about the various ways to deal with people who might think chooks are noisy or smelly or attract vermin. Half-a-dozen free range eggs will usually get you a fair hearing – a cake baked with your lovely, free range eggs might be even more effective! Here’s Olive showing us her chooks in her much smaller back garden. Olive and her parents, Sian and Tim, were part of the Sunnyside Up project and were delighted to show us their chook house with its viewing window and gorgeous artwork on the outside. Since that workshop lots of people have lamented not being able to attend, so the Kitchen Gardeners will be running another one next year. Meanwhile there are two more workshops for the year, November’s is Bees in the Backyard, and December’s is Summer Veg Gardening. If you’re not on the mailing list, please do subscribe to TTG’s newsletter so you don’t miss out. For those who wanted the jammy fruit cake recipe, it’s here. This entry was posted in Community, Event, Kitchen Gardeners, Waste & Recycling and tagged Backyard Chooks, Chickens. Bookmark the permalink. What a pity you’ve only just found us, as we won’t be doing any more chook workshops until probably the middle of next year. But if you are interested in other backyard food production ideas, as well as food preparation and preservation, the Kitchen Gardeners’ Society runs monthly workshops, the next being Sunday 3 November and it’s on bees in the backyard. RSVP to guildfordkitchengardeners@gmail.com to get yourself onto the mailing list.